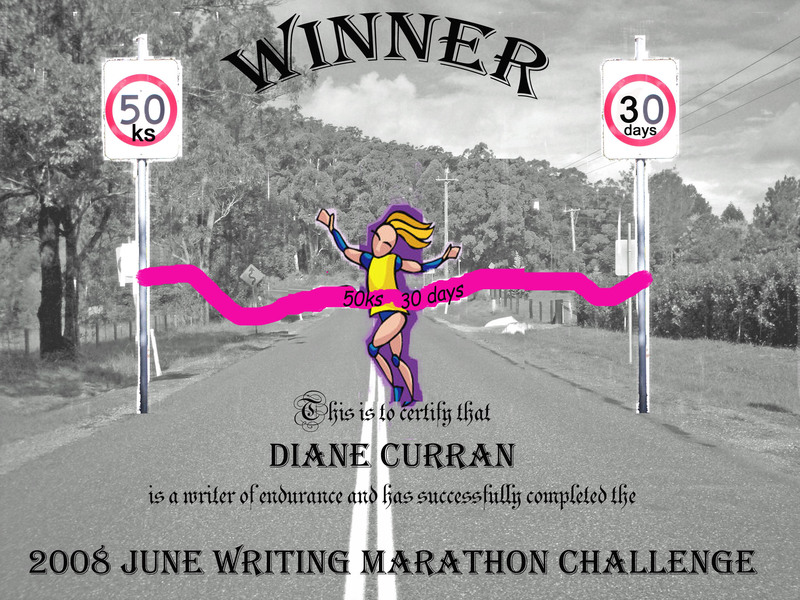 My winner's certificate from the challenge. I finished the 50ks in 30 days challenge with over 65ks, so I was very happy with that effort. It’s the most I have written in a 30 day period, and shows me how much more can be achieved when you have a great support network, including the amazing Rhian Cahill, who lapped us all, and Sandie Hudson, who came in 2nd. But Hold the Anchovies is still not finished. I know there will be some pieces of the story that will be scrapped (but in June, I just kept writing forward, I tried not to look back) – now I have a cumulative total (from the Nano 2004 challenge and the 50ks in 30 days challenge) of 80,107 words. I’m hoping at this point that I can finish by 85k, but sometimes these stories just keep going. And because much of it is based on real life, I can’t decide exactly on where I should end it. But I guess I have to make an authorial decision on that one! I do have to say that the story is not strictly memoir. I’ve taken liberty with the gaps in my memory, filled in plot holes, added stuff that could’ve or should’ve happened, and exacted literary revenge. I love the layout of your websit Diane. You were rocking with your story in June hope all is still going strong, hope one day i get to read it. It sounds like it would be a hoot to read.